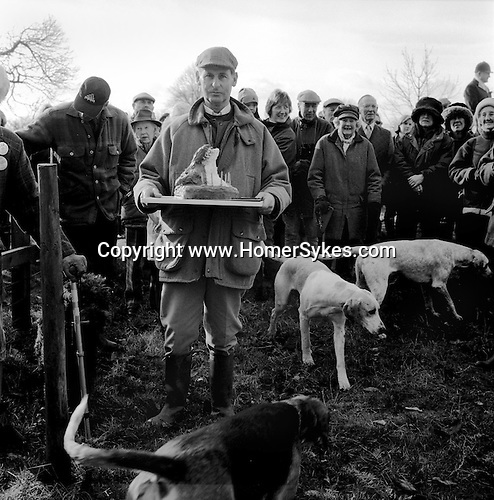 The Duke of Beauforts Hunt...The meet at the home of Mrs Elizabeth Pope to celebrate her 90th birthday. A chocolate cake in the form of a mounted foxs mask is presented, before being distributed amongst the well wishers. Near Avening, Gloucestershire. Hunting with Hounds / Mansion Editions (isbn 0-9542233-1-4) copyright Homer Sykes. +44 (0) 20-8542-7083. < www.mansioneditions.com >..